Each morning, Odin, the father of the Gods, sends his two ravens: Hugin and Mugin out into the world to watch over the land. The players try to help the feathered spies along their way over the various lands of the northern hemisphere. To move the ravens, the players must play appropriate flight cards from their hands. They may also get help directly from Odin. 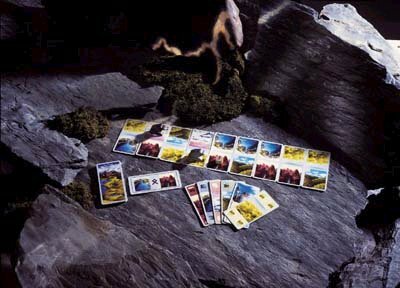 With skillful use of the cards, a player can move his raven quickly over the land. Interesting back-and-forth game that rewards planning ahead and maximizing your cards. The game is also quick enough that you don't have to plan ahead for too much time to get in a few rounds; a definite positive! This is a race game where you are simultaniously trying to advance yourself while creating obstacles for your opponent. Odin's Ravens is a lot of game in a small box. It appears to be a fairly simple race game for two players, but the mechanic of putting cards in your vault for later use gives it a whole extra dimension and makes it one of the best two player games I've ever tried. Odin's Ravens is hand management at it best.